This plant is one of the best houseplants for people who struggle to keep their plants alive, as it will thrive in almost any condition. One of the common names for it is ‘Devils Ivy’ because it will continue to grow and can become somewhat invasive even in conditions that would ordinarily be considered very poor for houseplants. The Golden Pothos will survive even with no natural light at all and is quite happily kept in dark or shaded corners. It will thrive on fluorescent lighting, thereby making it an ideal office plant. It will also sustain a hit and miss watering schedule, and therefore would be an ideal houseplant for anyone who forgets to water their plants regularly. Some even joke that the Pothos is virtually impossible to kill and will survive any number of poor growing conditions. Another reason that it makes an ideal houseplant is its ability to purify the air. Golden Pothos rates highly on the list of best air purifying plants, able to absorb or filter harmful chemicals from the air such as toluene, formaldehyde, xylene, trichloroethene, and benzene (NASA Clean Air Study- Interior Landscape Plants for Indoor Air Pollution Abatement). The correct scientific name for the Golden Pothos is Epipremnum aureum; however, it has been previously labeled various other scientific terms, some of which are still around, making it sometimes difficult to identify the plant by name. Europeans tend to refer to this plant as Scindapsus aureus, while most of North America use the scientific name Epipremnum pinnatum. Other scientific names that the plant has been allocated in the past include Phaphidophora aureu and Scindapsus aureau. Though the current name of Epipremnum aureum is correct, some plant sellers will still use the other names to identify the plant, so buying one can be a tricky business. Fortunately, the Epipremnum aureum, or Golden Pothos as it is more commonly known, is easily identifiable from looks alone. 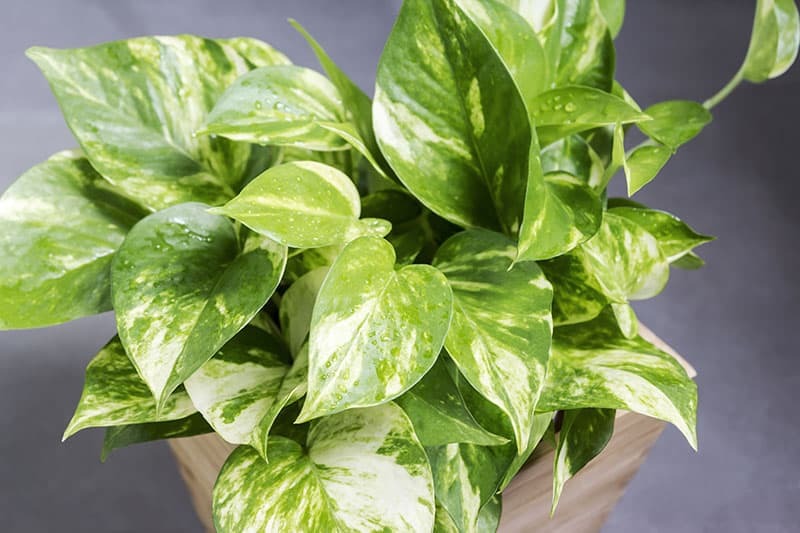 The telltale trailing leaves and variegated foliage will alert you immediately to whether a plant is or isn't a true Epipremnum aureum, though it’s helpful to be aware that names can differ. The Golden Pothos originates from Mo'orea, a French Polynesian island; however, it has seen been naturalized in a number of locations, including Australia, Japan, China, Indonesia, and the West Indies. It grows freely in tropical forests around the world, dominating any area it finds itself in. It has been known to cause ecological damage in some places, including Florida and Hawaii. At least two rainforests are known to have been destroyed in Sri Lanka because of the Golden Pothos and its invasive nature. It surrounds tree trunks and takes over floors of the jungle, killing off its neighboring plants. It is for this reason that the Golden Pothos is now banned from being grown outside in some US states. This plant likes its soil to be allowed to go completely dry between waterings. If it finds itself in continually moist soil, then it will fall victim to root rot. Simply check the soil by dipping a finger into the top layer before you water it. If it is dry to the touch, then you can proceed with watering, and if it still feels moist, then you can wait a few days before re-checking the soil for watering. It is sometimes recommended to wait for the leaves to drop before watering; this is one way that the plant can visually tell you that it is thirsty. The droopy leaves will spring back to life within a day or so of having a good watering. This is one tactic to use if you're unsure how often to water your Golden Pothos; however, you shouldn't let the leaves reach the point where they are so dry they begin to shrivel, brown, or fall off the plant entirely. This will lead to a very unhealthy plant which will become spindly and bare, though it is unlikely that it will die off completely as a result of under watering. If the soil is consistently too dry, the leaves have a tendency to turn rubbery in texture. A good watering once a week is sufficient for most Golden Pothos plants, though this may differ depending on its size and the conditions it resides in. During winter, the plant will need less water than usual but may benefit from an occasional light misting with a water spray bottle. Err on the side of caution when watering your Golden Pothos. Overwatering is always a much bigger problem than underwatering. Due to being able to withstand quite serious neglect, the Golden Pothos can tolerate dry conditions for an extended period of time without dying. The condition of the plant may suffer, and the growth will almost certainly be affected, but not to the point where it cannot be saved. Going on vacation and leaving your Golden Pothos without water will not be a problem so long as you continue to water it on your return. It is for this reason that it makes a great houseplant for anyone with a busy lifestyle who isn't around often to care for plants or someone who simply forgets to water them. This plant enjoys a mix of moderate indirect light and some shade and will thrive when in these ideal light conditions. However, it also famously does fairly well in very shaded spots or areas of poor-quality light, which makes it an excellent choice for offices where natural light is not in abundance. The Golden Pothos can withstand any lighting conditions and will even live through total darkness. If conditions are too dark, it will survive perfectly well, though growth will be stunted. 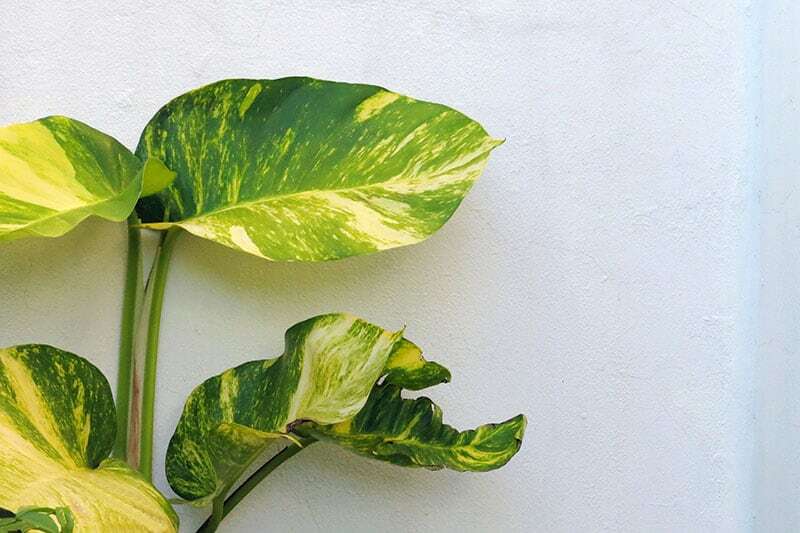 If you have a variegated variety of Golden Pothos, then the colored patterns on the leaves may fade or disappear completely when not given access to light. However, once put back in a well-lit spot, the variegation will usually return. On the opposite end of the spectrum, the plant can also tolerate bright direct light, but the leaves may burn as a result of this. The plant will still cope well with harsh lighting conditions, though if the plant needs to be on a windowsill that gets full sun, it would be best to use window blinds or drapes to filter the light to a more tolerable level for best growth. Light that is too strong can also result in colors fading from the foliage. The Golden Pothos likes normal humidity found in homes during summer months but will benefit from a light misting every few days during winter, particularly in especially dry air conditions. You could also sit the plant pot on a tray of pebbles surrounded by water. As the water evaporates, it will help to increase the humidity around the plant. The Golden Pothos is fairly good at communicating with its owner when it would like to be repotted. It will send aerial roots out in search of new soil, or will even break free from its pot when it is time to be moved up to a new sized container. 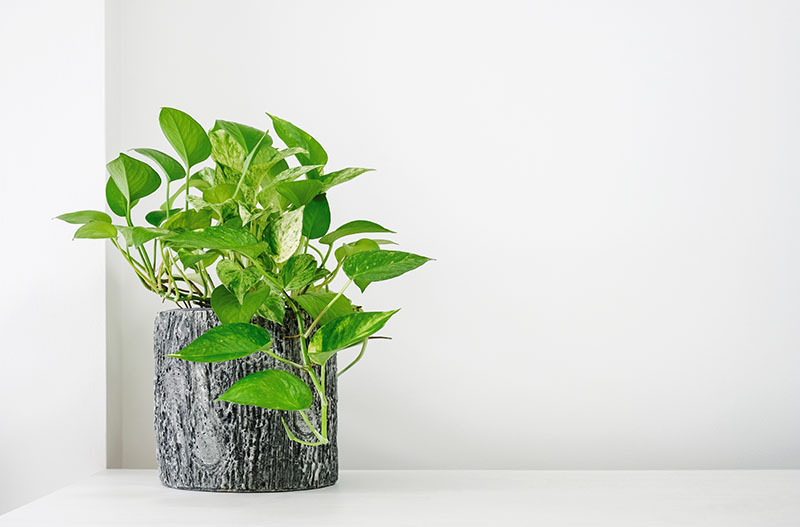 If you have noticed leaves falling from your plant in spite of ideal water and light conditions, then this is likely another way that your Pothos is trying to tell you that it would like a new pot. Pot the plant on in a container one or two sizes bigger, in potting soil. Encourage drainage by filling the bottom of the pot with pebbles. 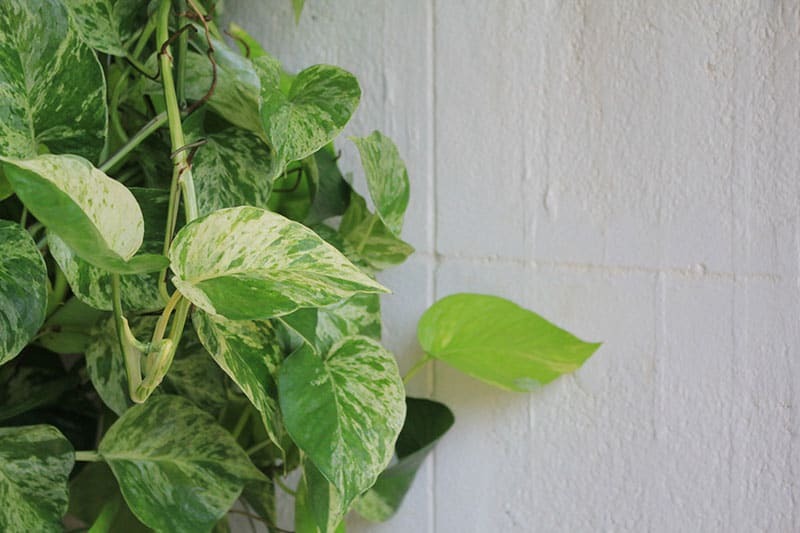 The Golden Pothos grows quickly and is a trailing vine that can easily become overgrown and look messy if it isn't pruned. The look you want to achieve will affect your pruning technique. To prevent it from becoming too leggy, you should trim stems back to the tips. This will help the plant to grow in a way that gives it a fuller appearance. If the plant gets too long, you simply need to cut back the length every so often. Though the plant isn't a natural climber, you can weave it around furniture, such as curtain poles or stair banisters, to give the effect of a climbing plant. As a trailer, it works particularly well with the stems left to hang from a pot on a tall shelf, though the vines do have a tendency to become tangled and messy, so it will occasionally need a shake-out to keep them separated. As a determined grower, it’s unsurprising that the Golden Pothos has a very high propagation success rate. Propagating this plant is very easy. Simply take a stem cutting from the tip and place it into soil, where it will grow roots and begin life as a whole new plant. You can also plant the cutting hydroponically in just water, which will give similar results. Cuttings from this plant tend to take very easily to life in a new pot and make great gifts for friends. An alternate idea if you would like another Golden Pothos plant that is already mature is to simply divide the plant in half when reporting it. Tear the plant down the middle, separating the roots, and repot each root bundle into a new pot of its own. The plant will continue growing as before. This is a popular variety of Golden Pothos that features a striking white and green marbling effect on the leaves. 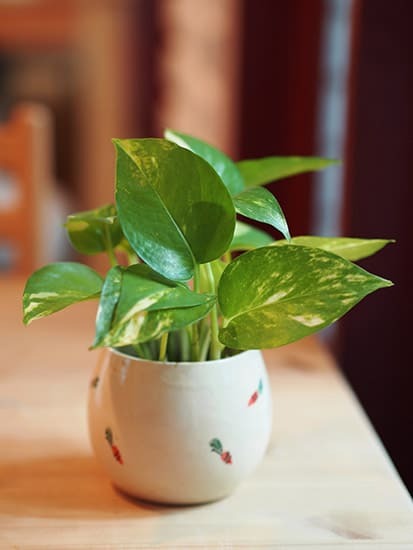 To prevent the leaves from turning all green, this plant requires more light than the standard Pothos. 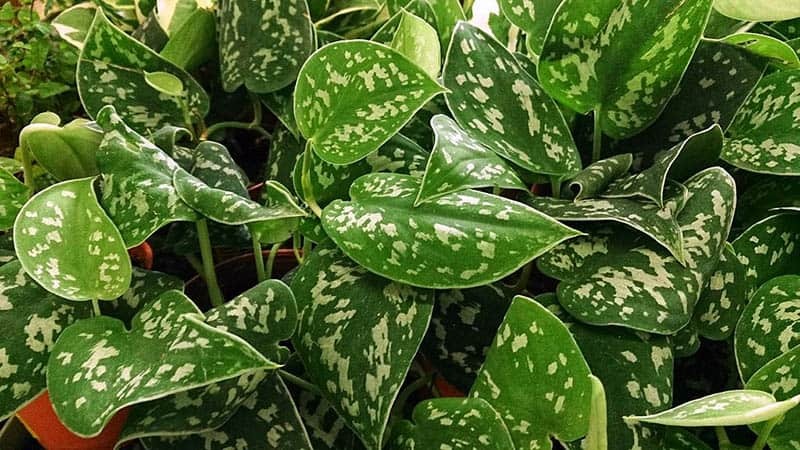 The leaves of this Pothos are almost gray in color, with silver markings. It is happy in low lighting and is tolerant of drought-like conditions. This brightly colored Pothos is tolerant of a variety of conditions, including shaded areas, though it will be happiest in bright indirect light. The lime green colored leaves have an almost glowing quality, which is very unusual. This variegated Pothos is a mutation of the marble queen variety. It features gray-green leaves with white marbling around the edges. All parts of this plant are toxic to humans, as well as dogs and cats. They contain insoluble calcium oxalates, which are poisonous if ingested. For this reason, do not keep a Golden Pothos if you have pets or children who are of an age that they might bite the plant. Alternatively, keep it high up and out of reach from any vulnerable members of your family. Nibbling on the plant can cause severe irritation of the lips, mouth, and tongue. It will cause a painful burning sensation inside the mouth, and if ingested, will cause stomach upset, along with vomiting. Pets may exhibit these signs along with excessive drooling and pawing of the mouth. In rare cases, ingesting the plant can cause swelling of the airways, making it difficult to breathe or swallow. Thought poisoning of pets is usually only mild to moderate, it can be fatal in some instances, so it would be advisable to visit a vet if you suspect your pet has eaten any of your Pothos plant (The American Society for the Prevention of Cruelty to Animals). This is most likely a result of overwatering and can be easily remedied by spacing out your usual watering pattern. Make sure you are using a well-draining soil and that you empty the tray so that the plant is not sitting in standing water. To ensure you are not watering the plant too frequently, always check the soil with a finger before you water it. The Golden Pothos likes to have its soil dry out between waterings, so if you feel moisture in the soil, then you should wait before watering it. If you think overwatering is not the cause of your yellowed falling leaves, then it may instead be caused by the need for the plant to be repotted in a larger container. The cause for this problem will either be overwatering or a sudden drop in temperature. If a temperature drop is to blame, the plant will likely also feature sad looking leaves which droop down. If this is the case, cut away the rotting stems and allow the plant time to recover by itself once it is in a position of a more stable and suitable temperature. If overwatering is the cause of the problem, you should also check for root rot. Remove any rotten stems, cutting the plant right back if necessary. To treat root rot, you will need to repot the plant in new soil and ensure to follow a more appropriate watering regime in future to avoid the same problem happening. Once the rot has been removed, and the plant is in fresh soil, it should recover well and continue to grow. Browning leaf tips usually indicate a humidity problem. Increase humidity by misting the plant with a fine water spray every other day, and you should see this symptom resolve. If the edges of the leaves turn brown, dry, and almost crispy, then it is likely the plant has been kept dry for too long between waterings. This is a much less common problem than overwatering and is easily remedied by watering more frequently or by giving a heavier watering on the same frequency basis. If your previously variegated leaves become a solid green, this indicates that your plant needs more light. If the opposite occurs and your variegated leaves turn to a pale and faded pattern, this is likely due to too much bright light. In response to prolonged direct light, the foliage turns lighter in an effort to protect itself from the sun. If either of these problems occur, they can be easily solved by adjusting the level of light your plant gets. Once in a more suitably lit environment, the variegation should return. 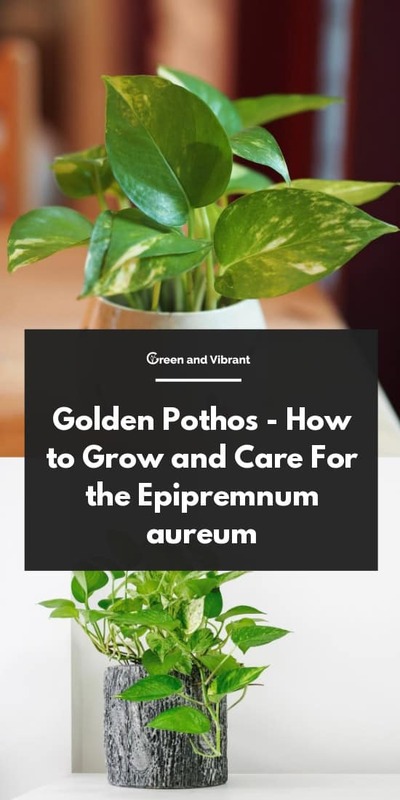 If you have a Golden Pothos and have found this article helpful, please leave a comment or share this article with another plant lover.